I know it sounds obvious, but I get inspiration by just keeping my eyes open reeeeally wide all the time. But lately I’m especially inspired by travel, which I try to do as much as I can — it really keeps my ideas fresh. I’m currently living in Lisbon and find the city's color palettes so exciting. One house will be painted a soft peach, the next a bright yellow, the next a soft mint — and voila, a beautiful palette. I’m constantly seeing little unexpected and often unintentional motifs around me… the way two traditional terracotta bowls stack, the way the banana leaf outside my bedroom window is framed, the new-to-me lush vegetation around Portugal. And there are some sources of inspiration that never grow old for me, like good old Mother Nature, Art Deco and the elegant work of the father of pattern design, William Morris. Why were you excited to design for Mixbook.com? I thought the brand was really fresh and modern, and I admired the other brand collaborations Mixbook had already done — I knew I was in great company. And when I first started the design process, I really felt that it was a true collaboration — that Mixbook was really on my side and wanted to help, but also allow me to do my thing and really feel free to design what felt right to me. They were a true cheerleader! 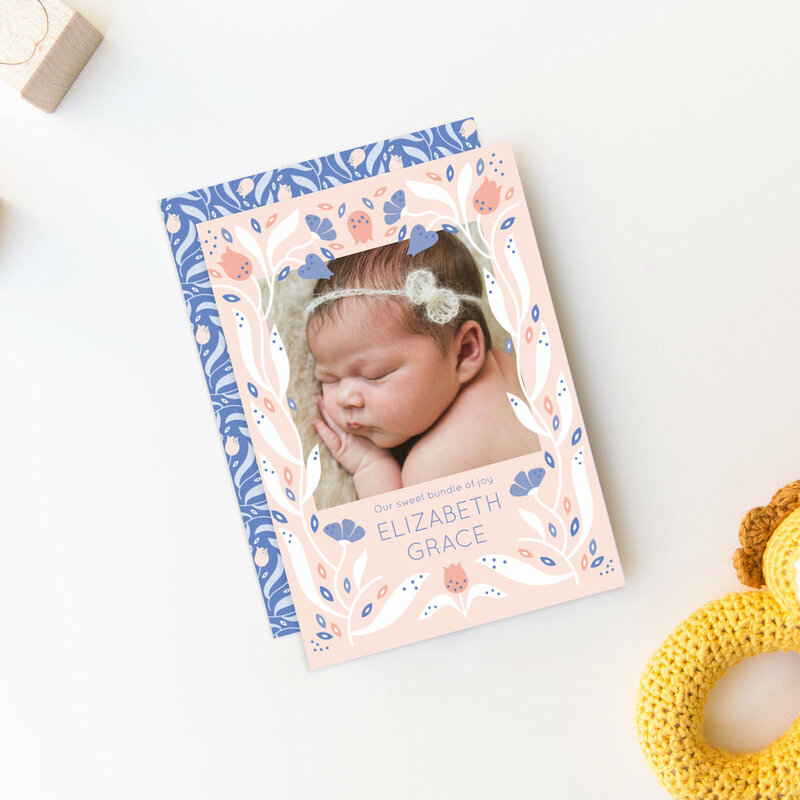 I also knew that the design editor that customers use to build their own cards was extremely easy to use, so I knew I would feel good sharing the collection and encouraging my own followers to use Mixbook when the collection launched. What about this collection are you most proud of? For me, a big part of what makes something special is the heart and soul that goes into it and while I was designing this collection, I was fully engaged with the process. I had a lot of stop-stare-clap-your-hands moments as I was working on them, just excited to see what was developing in front of my eyes. I guess what I’m saying is that I’m most proud that the collection has a lot of heart behind it, and I think that it shows. Which card or design is your favorite? If forced to choose, I really love the Art Deco cards! I think they’re quite different and special — a fresh and original theme for baby. 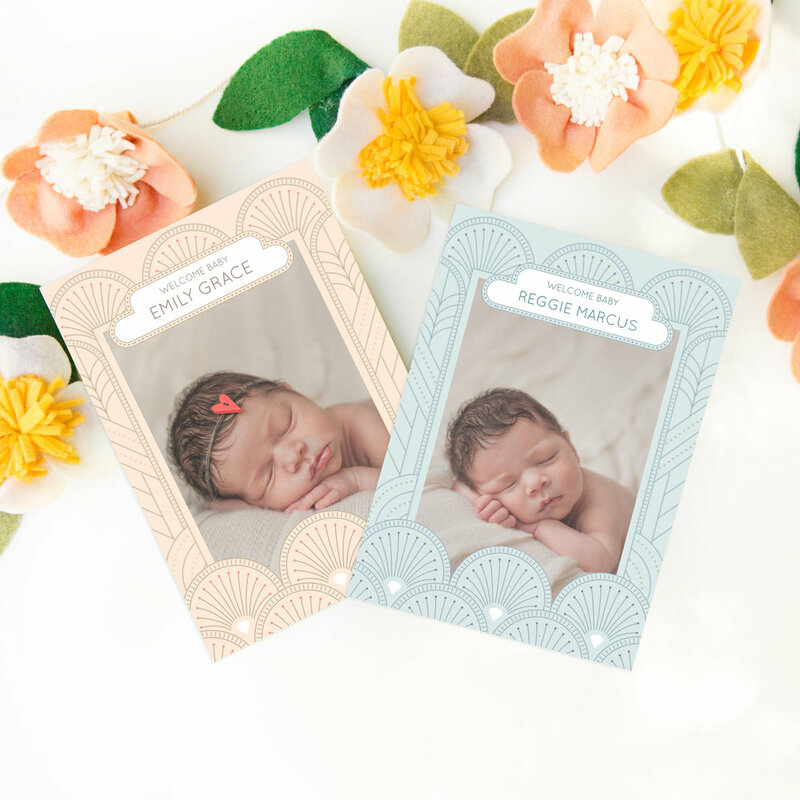 They’re sophisticated and quite ornamental, I suppose like a frame for a great masterpiece, which I think is a beautiful homage to the cherished babes that will be featured in them! Describe this collection in three words. Love these designs? Check out the full Elizabeth Olwen collection on Mixbook.com.